How often is a Google mark cited by the examiner? Turns out… pretty frequently. About a citation each and every week! Here’s a peek at all of Google’s marks (at least the ones identified within USPTO records as from the company) that USPTO examiners have cited over the past 5 years (267 times, actually). Following the format in our popular 2(d) Citation Watch, we display the refused marks (green) to right of the cited marks (red). If one looks at instances when a mark incorporating the actual term “Google” was refused, you’ll find 71 different refusals. What might be the rationale for these futile attempts? 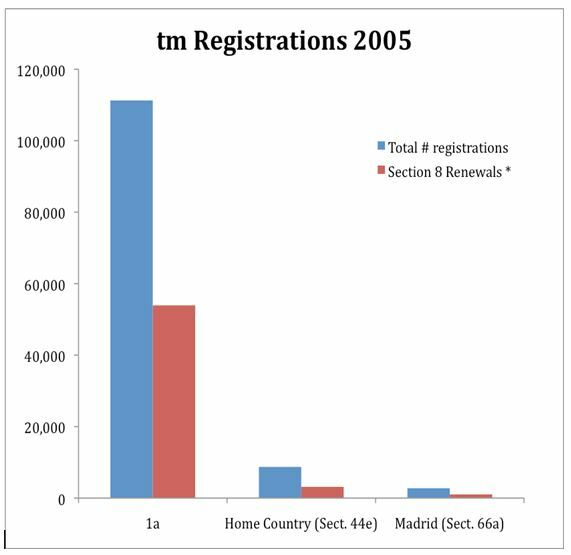 Does anyone truthfully believe they can successfully register a trademark making use of this term? If you’d like to know how often the marks in your portfolio are cited, why a mark was cited, and who was refused as a result, you may want to subscribe to our 2(d) Citation Watch; the most cost-effective trademark watch available. Ask us for a complimentary report. As many have come to expect, here is a summary of our annual compilation of firms that filed the most oppositions in 2013*. To see a detailed report for each of the Top 30 firms, showing plaintiffs, defendants and case links, ask us for a copy of our full report (pdf file). Request your copy. Aside from the Top 4 opposition-filing firms which stand out significantly from the crowd, the differences between most of the firms are very close indeed. There are actually 87 firms that rank within the Top 30 opposition filers; those that filed at least 15 oppositions last year. 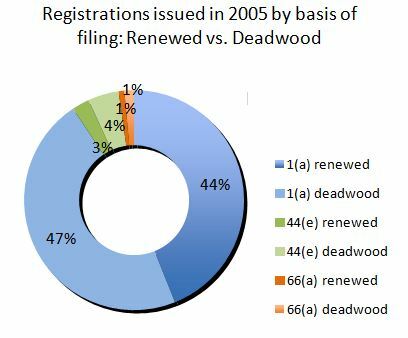 Also noteworthy is that the Top 5 represent almost 12% of all TTAB oppositions filed in 2013 (over 5,400 oppositions filed in total). Note: The chart shown here includes only the Top 20 ranked firms. Our complete list of the Top 30 ranked firms by oppositions filed (including links to each individual TTAB case) is available upon request. Subscribe to our popular 2(d) Citation Watch or Bulk TM Watch services and watch your IP practice grow! Looking more closely at the actual composition of the opposing parties within each firm’s portfolio, several general attributes come to light. For many of the Top 20 ranked firms (by oppositions filed) there are one or two key clients that are responsible for the majority of the oppositions filed. For example, Cowan Leibowitz has had most of their oppositions for many years now due to Major League Baseball and many of their associated teams. Knobbe Martens has filed a slew of oppositions for Monster Energy, and likewise Neal Gerber for Beats Electronics. All of Hanson Bridgetts‘ oppositions filings are due to a single client. Whereas firms like Kilpatrick Townsend and Fross Zelnick have a good mix of clients they represent as opposers, without any particular standout accounting for the majority of their opposition filings. So it may be further insightful to analyze how firms rank if we express their opposition work not by the sheer number filed, but by a relative ratio of the number of different clients within their opposition portfolio to their total number of oppositions filed. Essentially, this metric becomes a client-opposition variability ratio, an indicator of the breadth of the firm’s opposition portfolio. Following this logic, we have re-charted below these same firms using this variability metric to compare how they rank with respect to oppositions filed based upon the number of different clients they represent as opposers. 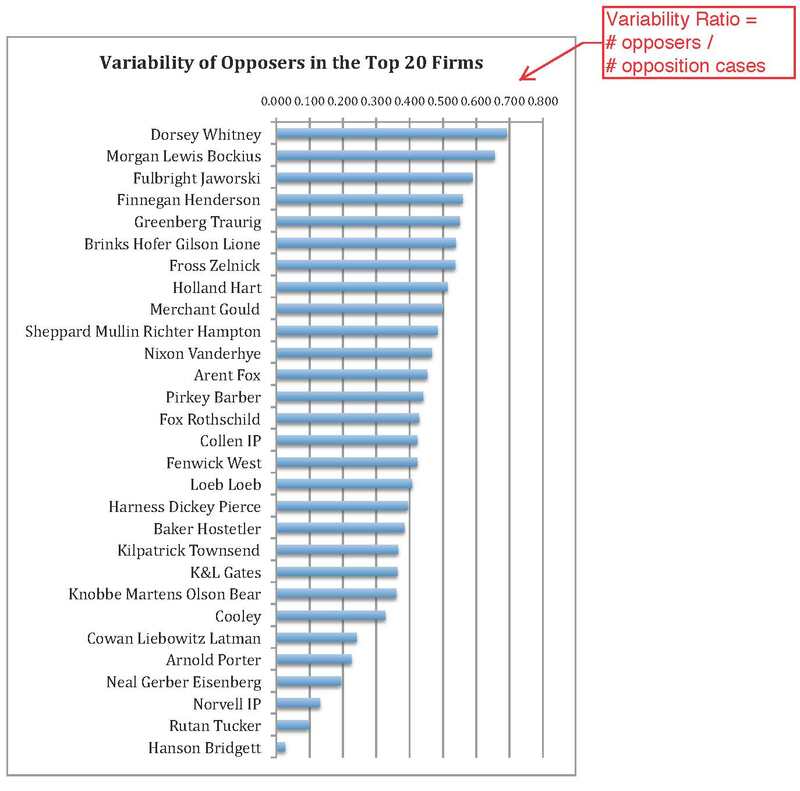 This results in a levelling of the playing field, so to speak, and firms in the middle of the pack with respect to overall opposition filings, such as Dorsey Whitney and Morgan Lewis Bockius, rise to the top due to the relative breadth of their client base, while some of the aforementioned firms fall considerably within the list. Is this any fairer a method of comparison? As any attorney will attest to, it’s all relative. As many have come to expect, here is our annual compilation of firms that filed the most oppositions in 2011*. 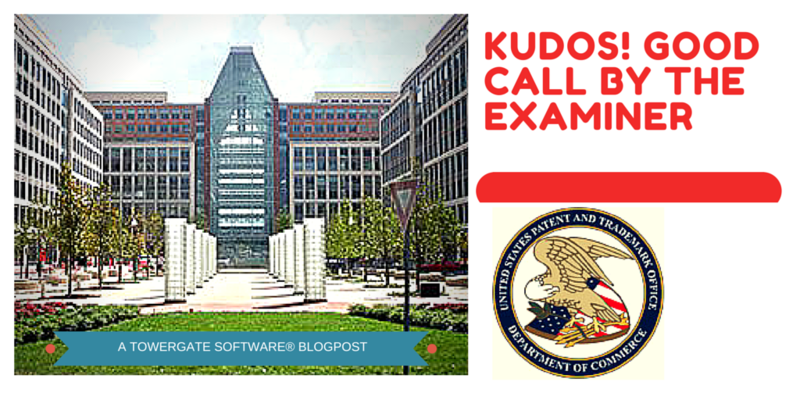 Click on the [+] to expand details for each firm to show all plaintiffs and case links. Aside from the top 3 firms, the differences between most firms are quite close. 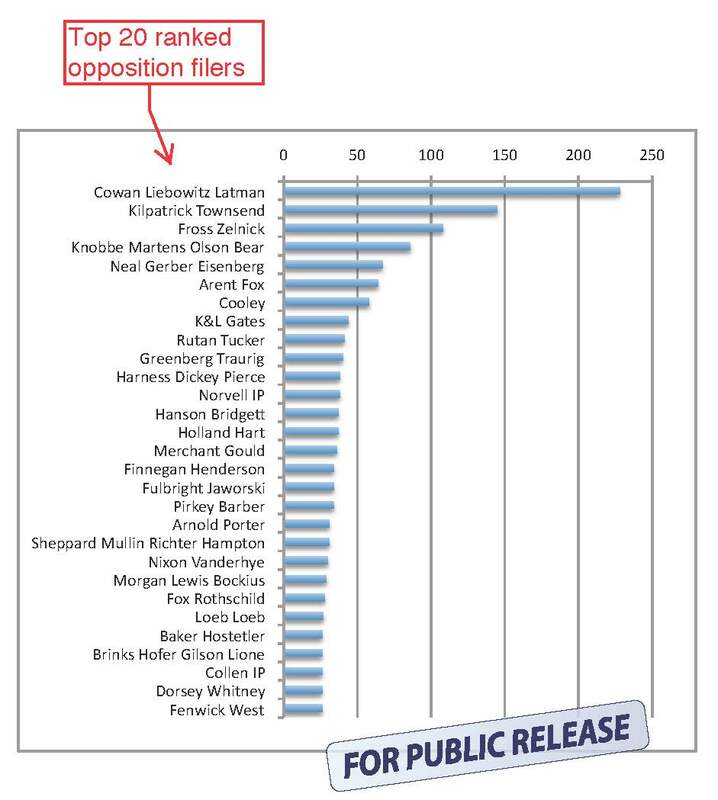 There are actually 41 firms that filed at least 20 oppositions last year. 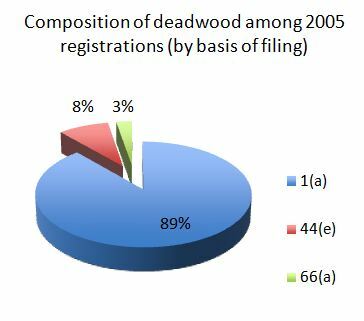 Also noteworthy is that the top 5 firms represent more than 10% of all oppositions filed. TowergateTM is our new online search engine with powerful, intuitive and exclusive features found in no other TM search platform. Your search results can now be flagged for marks that have been refused or cited under 2(d), and marks that have been opposed or that have opposed others. You can easily search by virtually any field imaginable, reorder your searches, highlight key terms within the goods & services, cross your queries, get granular control of search terms by adjusting the level of phonetics or by limiting the adjacency of terms, generate customized reports, etc,. It’s how you would construct your own search engine if you could…because we’ve incorporated years of user feedback to reflect how you want it to function! Ask us for a demo & more info. Note: The list shown here includes just the top 16 ranked firms. Our complete list of the 41 top ranked firms by oppositions filed (including links to each individual TTAB case) is available. Request your copy. We pleased to announce that the US Department of Homeland Security has recently awarded Towergate Software the contract to monitor its entire portfolio of trademarks. Our unique methodologies and proprietary software will provide optimal watch coverage on a worldwide basis for the variety of Homeland Security marks, including many design marks, spanning the various government departments and agencies under their wing. We’re very proud that Homeland Security has recognized the dedication we bestow upon the work required, and the overall value proposition our services offer to such an important portfolio.